OTTAWA — NDP Leader Thomas Mulcair says he will not tax the super-rich and will not increase personal income taxes —despite the fact that some in his own party think it’s the way to go. 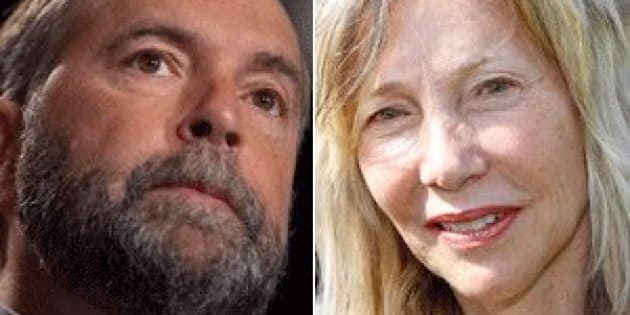 NDP candidate Linda McQuaig, selected by New Democrats on Sunday to represent them in an upcoming Toronto Centre byelection, told The Huffington Post that she still favours taxing the rich at a higher rate despite what her party's leadership says. "They should pay more," she said in a phone interview on Monday. Over the past 20 to 30 years the very rich have got richer but the proportion of taxes they pay has dropped, McQuaig said. "We definitely need higher taxes on the rich," she said. "First of all, we need the revenue to do what we want to do and, second of all, we need a better distribution of income in the country. We've developed too big a gap between the rich and the poor." McQuaig co-authored a book with Neil Brooks, "The Trouble with Billionaires," calling for steep marginal tax rate increases of 60 per cent for the rich — those earning above $500,000 a year — and 70 per cent for the super-rich — those earning $2.5 million a year — in order to address income inequality in Canada. The problem right now, McQuaig said, is that the top marginal rate kicks in at about $135,000 at the federal level but stays flat after that. "So, whether you are earning $135,000 or $1.5 million or $3 million, you pay the same top marginal tax rate," she said. McQuaig, who is campaigning for a seat in one of the country's wealthiest ridings, said she does not think advocating higher taxes on the rich is political suicide for a party. She says right-wing arguments against tax increases — that the rich will flee and the use of tax havens would increase — have not proved true, and have only limited the capacity of the state to provide public services. But Mulcair, who told HuffPost earlier this month that an NDP government would fund universal day care and invest more in post-secondary education and aboriginal education, has categorically ruled out taxing the very rich. "If you look at the combined federal and provincial rate in several provinces, it's over 50 per cent," Mulcair said. "With regards to personal income taxes, it's not on the table to increase them. That is a consistently held position," he told reporters Monday. The top federal tax rate — for income above $135,054 — is 29 per cent. Quebec and Nova Scotia, where the NDP is fighting to be re-elected, are the only two provinces with a combined rate above 50 per cent for high earners. In Quebec, people earning more than $87,123 pay a marginal tax rate of 50 per cent. In Nova Scotia, people earning more than $150,000 pay 50 per cent. Alberta offers the lowest combined rate at 39 per cent for high earners. In Ontario, where the provincial NDP forced the Liberal government to enact a two per cent surtax on the super-rich, the tax rate for income above $509,000 is 42.16 per cent. Former NDP strategist Ian Capstick told HuffPost the federal NDP won't muse about tax increases because it's afraid of Bay Street. "People who are from Bay Street don't want their taxes increased, and without Bay Street, you cannot win elections," said Capstick, who runs the communications firm MediaStyle. "Without Canada's bankers behind you, Canadians view you as being fiscally irresponsible." All it takes is a handful of chief economists from Canada's largest banks to hem and haw in unison, Capstick said, to kill a party's electoral prospects. "While it might be a great idea from a public policy standpoint, it is a horrific idea from a political standpoint." Mulcair spokesman George Smith would not say whether the NDP might consider hiking the GST or rolling back the Conservatives' boutique tax credits to pay for increases in social spending. Mulcair has said he plans to increase corporate taxes by a few percentage points. The NDP's electoral platform has also typically included cuts to business subsidies, such as in the oil and gas sector. The Liberals and the Conservatives refused Monday to be as categorical as the NDP leader. Prime Minister Stephen Harper's press secretary, Carl Vallée, told HuffPost that the government would never comment on the content of the budget ahead of time but, on the question of taxing the super-rich, "the government has lowered taxes consistently and is committed to keeping them low." Liberal Leader Justin Trudeau's office told HuffPost: "Liberals firmly believe that middle-class Canadians are under significant financial pressure, and we are not interested in any policies that exacerbate this challenge." Trudeau's spokeswoman, Kate Purchase, would not say whether the Liberals would consider a special tax on the super-rich. The Liberal candidate in Toronto Centre, Chrystia Freeland — who has also co-authored a book on income inequality, "Plutocrats: The Rise of the New Global Super Rich and the Fall of Everyone Else" — was unavailable for an interview. Her spokeswoman could not say whether Freeland favours a tax on the super-rich. Raising taxes on the wealthy isn't a new idea. This spring, during the B.C. election, NDP Leader Adrian Dix suggested that the province's top two percent — those earning more than $150,000 a year — should pay a top provincial rate of 19 per cent — a 4.3 per cent increase. He was defeated at the polls. But when the writ dropped, his Liberal opponent Christy Clark also suggested a tax on the wealthy. The Liberals' budget called for a temporary tax raise to 16.80 per cent from 14.70 per cent for those earning more than $150,000. A Forum Research poll last year suggested that, in Ontario, the NDP's surtax on the rich was immensely popular — it garnered 78 per cent support among those surveyed. The Fraser Institute's Charles Lammam told HuffPost that while taxing the rich may be popular, it creates a disincentive for people to work harder. In a globalized economy, the workforce is mobile and doctors, engineers and accountants will not come to Canada if they feel their pocketbook will take a significant hit, Lammam said. "They have to have a personal tax system that attracts and retains them, not discourages people from coming to the jurisdiction," he said. "If we have rates that are uncompetitive with other jurisdictions, the risk is that those people will move to those other jurisdictions. That is a real risk." Marc Lee, an economist with the Canadian Centre for Policy Alternatives, believes taxing not only the rich but the middle class is the only way to go. "The easy part is tax the rich — and we should definitely do that but if we want to fully realize the potential of providing better quality schools, providing childcare and early learning services to kids, expanding the scope of the health care system to include dental coverage, all of these things are open for public debate and the result of it is how do you pay for it? I don’t think you can only tax the rich to do that. You need broad-based tax increases." The public is unlikely to see that suggestion from any party — especially the NDP, said Jonathan Malloy, the chair of the political science department at Carleton University. "The NDP, and quite particularly Thomas Mulcair, are obsessed with downplaying their ideological aspects and emphasizing the idea of good, solid public administration," he said. "The mantra of 'tax the rich' is a common NDP one," Malloy said, "but that is exactly the edges that [Mulcair] is trying to sand down, any sort of idea of class warfare." For McQuaig, it is not class warfare but reasonable policy and one she said she will continue to advocate from inside the NDP caucus if she is elected. "I am absolutely sticking to the positions that I have taken over the years, and the party knows that," McQuaig said. "I think it reflects that the party wants debate on these kinds of issues."